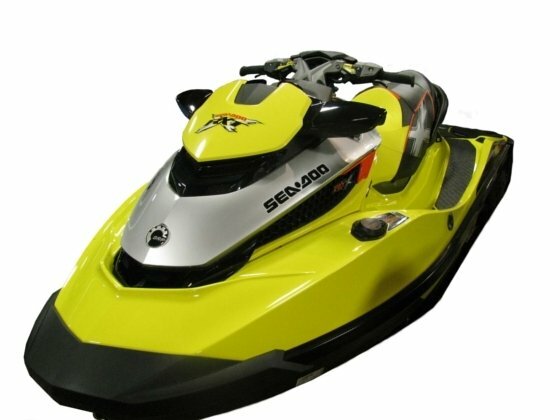 Protecting your Sea-Doo Jet Ski with a cover is one of the number one ways to preserve its value. Your watercraft can take a lot of abuse when you have it out on the water. Once you are done for the day, show it you appreciate all its hard work by covering it with one of the premier covers offered by CoversDirect®. Offering your unit protection from scratches, UV, and airborne pollutants, you will also be extending the life and beauty of your craft. CoversDirect® offers Sea Doo jet ski covers by top manufacturers Westland, Carver and Covercraft. Whether you own a GSX, GTi, SPX, Wake Pro, RXP, or other model, we have the cover for you! We offer both custom and styled to fit jet ski covers which can be used for all types of coverage such as trailering, mooring, or dry storage. Covering your jet ski has never been easier! Need a cover specifically for trailering? Our custom cover by Covercraft would be an ideal choice for this purpose, and Covercraft offers exact fit patterns for all the most popular models including the XP, Wake, and RXT . The cover's mirror pockets and tight fit will ensure it stays securely in place even when driving at high speeds. Sewn in tie down loops create an added security feature, along with the durable shock cord which is also located in the hem. Reflective strips that are sewn into the back of the cover make sure your PWC is visible to other drivers. Sewn in heavy duty reinforcement material guarantees that even with lots of use, your cover will not experience abrasion. Ultra'tect and Sunbrella materials are available for Covercraft jet ski covers. Westland Industries exact fitting PWC covers are an excellent choice for mooring. These covers feature a shock cord sewn throughout their hem, so securing them to the craft is a breeze- just affix the cover properly and tie the cover down. Loops are also positioned throughout the cover's hem to provide for additional tying down with straps, or weighting down with mooring bags or suction cup tie downs. Sharkskin and Sunbrella materials are available for Westland PWC covers. Carver Industries watercraft covers are perfect for storage on a trailer. These covers are not custom patterned like our options from Westland and Covercraft, but made per the dimensions of the PWC. Available in six sizes, these covers provide a more general fit for your craft, while still furnishing it with the protection it demands. The shock cord which is sewn throughout the hem is made to be stretchy, allowing you to apply and remove the cover with ease. The cover will feature loops sewn throughout its hem, and the needed tie downs are also included (quantity 6). Marine grade polyester materials PolyGuard and SunDURA are available for Carver watercraft covers. No matter which of our three manufacturers covers you choose to protect your PWC, you can rest assured that CoversDirect® guarantees quality and satisfaction on all of our products. We also guarantee the fit of any and all the covers our manufacturers apply! You can start choosing your jet ski cover through the application guide below, or give us a call for assistance!